Antique ethnographic Middle Eastern flatweaves have been my passion for many, many years, and they are the focus of my website gallery collection. I hunt mainly for 19th century textile art--the best I can find--including pieces for collectors with limited budgets. Within these parameters, I am selective: I want pieces with strong design, lustrous wools, beautiful clear colors and refined weaves. I want textile art that displays individuality and experimentation. In other words, I want products that reflect the artistic personalities of the tribal weavers--albeit women working comfortably within their groups' traditions. Some pieces may be fanciful or even downright crazy, others austere and elegant. My comments on these pages are focused on Middle Eastern tribal weavings, but the concepts apply to genuine ethnographic textile art from cultures around the world. I frequently hear people say that the age of a piece doesn't matter to them--that they only care about quality. I feel the same way, but unfortunately, there has been a serious degeneration of this wonderful art form over the past 80 to 120 years, and the stacks of coarse, sterile, garish kilims readily available in most markets are but poorly woven copy work displaying little sensitivity or creativity. We must now search more and more diligently to find superb pieces, and that normally means early examples. Unfortunately, the vast majority of Middle Eastern kilim dealers handle only 20th century goods, often without a single piece more than 60 or 70 years old in their inventories. Early dates are not enough, however, to insure aesthetic merit. Dull, dingy antique pieces need not automatically command our respect. A boring, poorly designed weaving rarely improves with age. Rigid, mechanical-looking "factory" or workshop rugs and other commercial weavings have short-lived appeal; in contrast we can quickly grow fond of the irregularities that occur routinely in old ethnographic village and nomad textile art. Abrupt changes in color, motif or proportion reflect a carefree, lively attitude toward the work. Such anomalies are not considered mistakes, nor are they signs of inept work. Unmatched pattern repeats have rarely bothered the traditional weaver; many indeed were purposeful. I have heard Turkish nomad women laughingly dismiss peculiar design irregularities in their own work as "more interesting." I have seen mothers reluctant to correct their daughters' work. Country weavers are rarely concerned by erratic shifts in warp fringe color, rarely concerned when their weavings or motifs are irregularly shaped--a frequent occurrence if nomads' looms are moved about. We too must realize that the essential qualities in this folk art are freshness, vitality, pleasing color, superb materials and excellent design. In contrast, handmade commercial carpets and kilims have no individuality. Personal expression and subtle nuance are rare in cottage-industry or "workshop" products from around the world. It is irrelevant that the stacks of modern weavings in most import shops or carpet stores are hand-woven or hand-knotted. It is irrelevant that they are well crafted and made with good materials. Their technical quality is irrelevant. They are assembly-line products, little different in concept from wallpaper. No collector would want paintings mass-produced to an export merchant's specifications. Nor should anyone confuse monotonous mass-produced, commercial "paint-by-number" rugs or other weavings with authentic ethnographic art. It is essential for a beginning collector to understand their differences. Since I have a weaving background, excellent structural design and fine craftsmanship are important criteria for me, along with dynamic imagery. Because designing in slit-tapestry, brocading and the warp-patterned weaves is so challenging, I find them the most fascinating flatweaves. Weft-substitution and soumak textiles also provide endless delight. Unfortunately, with all of these, there has been a severe deterioration of standards over the past 100 years, and so for excellent examples, we normally are forced to look for older pieces. Most 19th century nomadic and village weavers spent laborious hours combing their wools to produce the finest, most lustrous hand-spun yarns. More recent weavers found it much easier to card their fibers or even have their wools commercially machine carded. Such wools, even when hand-spun, were more dull, lusterless and decidedly inferior for kilims and bags. Along with this change in processing came alterations in the fine weave balances so carefully developed by each community over the years as warp and weft elements were fine-tuned to interact effectively. Unfortunately, photos don't capture the subtle differences in refinement between older weavings and most 20th century products, but once seen side by side, nearly everyone can appreciate the quality differences. Natural and synthetic-dye color comparisons intensify the differences. The contrast can be as dramatic as a couturier gown alongside a Wal-Mart special. Usually I hunt for true ethnographic folk art--weavings or other textiles made for the weaver's own family, and not specifically for sale. This is one reason for my concentration on nomadic flatweaves; unlike pile carpets, these were not commercial products made for export until recently. Years of personal studio experience have taught me that although an artisan takes pride in his or her work, attitudes toward it vary considerably, depending upon what is to be done with the completed product. Marketplace demands affect most creative work adversely, and we should not be surprised to find commercial products sterile--whether old or new, whether geometric or floral, whether from city or village. Occasionally individuals proclaim sanctimoniously that in buying new weavings they are "supporting the craft" or "helping to keep the old traditions alive." In my opinion, perpetuating any craft is pointless if the work produced is uninspired--if it has no soul or meaning to the artisan. Anyone can be taught processes and techniques in a short time, but individual or cultural significance can rarely be imposed upon commercial products. Thus "revival" projects rarely produce significant textile art. The imagery in old tribal weavings may have had important symbolic meanings for nomad and village artisans at one time, but most knowledge of such symbolism has now nearly all been lost. It's merely been convenient to keep using "traditional" motifs. In some instances, weavers have simply reveled in manipulating pure color and geometry. Occasionally village women have pointed out to me small good-luck charms that they have incorporated in their work. But normally, we can only speculate on these topics. Unfortunately, such speculation is rampant in rug literature. We can only know for sure that flatweave structures and techniques have played important roles in shaping designs in tribal textiles. Since we are on such shaky ground when interpreting ideational content in old tribal textile art, such matters should play little role in our selections. Anyone who decides to buy a rug because the seller imagines mythical creatures in its patterning should realize that injecting bits of fantasy into each sales pitch is a time-honored rug merchant's game. The "mihrab" in prayer kilims is one exception to the matter of forgotten symbolism. The prayer arch format normally represents the mihrab which in each mosque quibla wall indicates the direction of Mecca. 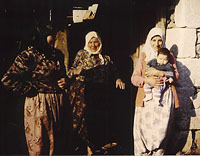 Turkish villagers who wove kilims often hung such pieces in their small houses to show the direction of Mecca for women and girls of the family who said their prayers at home, while the men attended the local mosque. Old bags are of special interest to me--saddlebags, storage sacks and tent bags--as their small scale encouraged individual experimentation and creativity. Decorated �uval made by Anatolian nomads are my personal favorites. Because until recently they have received little coverage in the literature, I have been able to acquire excellent examples: both complete bags and bag faces. 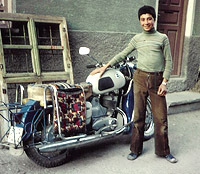 I have even found old traditional textiles put to startling new uses: moved from the family's donkey to motorcycle! Collectors should keep in mind that the textiles currently in vogue are rarely the best bargains. Prices inevitably rise after any group of rugs or weavings has been researched and published widely. Then fashions change as the next group is promoted. Incidentally, fine ethnographic rugs and other textiles are never priced by the square foot. Small pieces can be more expensive than large rugs. As with any art, value is determined individually. Interesting tribal weavings have come from many parts of Western and Central Asia, as well as North Africa. After 50 years of studying and handling the pieces from many different regions, I must admit that the kilims of tribal Anatolia�the Asian part of Turkey�have won my special affection. Although good early Anatolian examples are rare, I am compelled to search them out; for me they exemplify the most powerful and accomplished woven tribal art. It is these astonishing textile masterpieces that have become the focus of serious collections and museum exhibitions throughout the world. We of course cannot ignore stellar works produced by other weaving groups, especially those of Western Persia and the Caucasus. Remarkable bags and small pieces have been produced by Turkic groups in those areas such as the Shahsevan. We of course pay premium prices for antique rugs and textiles in excellent condition. A nineteenth century carpet or kilim in superb condition commands much, much more than a worn, stained, badly repaired or badly faded piece. But nearly all antique textiles and rugs have sustained some damage, and consequently, some restoration. Most old pieces seem to have holes, tears, fraying or wear, if they have not already been "repaired." Iron oxides in brown dyes tend to corrode the wools with time, so brown yarns wear first, and eventually disappear. This is a natural part of a textile's aging. A few other colors corrode also -- particularly magentas and pale gray-greens. Opinions differ as to whether antique tribal pieces should be restored or merely conserved. Extremely early pieces should rarely be restored, but with weavings of moderate age, a case-by-case judgment seems wise. It may be sensible to reweave a distracting hole in the center of a design, but leave frayed edges alone. I sometimes leave village or tribal repairs untouched; they are an interesting part of a weaving's history. Instead of reweaving damaged areas on their kilims or bags, nomadic weavers have either just patched them, or woven new articles as needed. In the photo, you see a tribal repair: a hole in a storage sack merely crocheted shut. It was an easy and practical way of prolonging the item's useful life. Professional modern restoration work, in contrast, should be very difficult to detect. If we are to use an old kilim or pile rug on the floor, frayed areas need to be rewoven or at least stabilized to prevent further damage. Fragments or very early pieces can simply be mounted, or stabilized and hung. (See my notes on Mounting and Hanging Textiles.) Since my gallery clients have differing views on restoration, I restore some pieces, but leave others untouched. So what should a collector do when faced with choosing between an unexciting, recent piece in perfect condition, and an interesting but damaged older textile? This is an individual matter, but the quality of the artistic expression is of course paramount. Many folks are now collecting fragments of early weavings, and mounting them for display. Meanwhile, the quality of available restoration work is improving, so the options are multiplying. Over the years, I have concentrated on buying weavings in excellent condition, and indeed, it is those that have increased the most in value. If you would like to read a more detailed discussion of restoration and conservation questions, go to Restoration Issues. Most collectors hunt for old weavings that feature clear, strong vegetable-dye colors, meaning that we must usually focus on pieces more than 110 or 135 years old. The first widely used synthetic dyes became available in the 1880s, and at first were used along with traditional natural-dye colors. 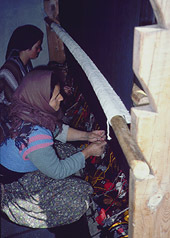 In some isolated areas, natural dye usage was retained for longer periods. I've found relatively late Anatolian �uval with all natural dyes, for example. Although experience helps us to recognize natural-dye palettes, the origin of many colors cannot be guaranteed without expensive dye tests. Thus rugs are far too often represented as "vegetable-dyed" by promoters with no concrete knowledge of their origins. We sometimes see rugs with the most garish chemical colors misrepresented. On the other hand, pieces from remote areas may display natural dye combinations that are unfamiliar. Dye expert Harald B�hmer, in Rugs of the Peasants and Nomads of Anatolia, points out the vastly different color ranges in pieces from the three major areas of Turkey, for example. We are most familiar with Western and Central Anatolian pieces, and so find the natural dye color usage in some Kurdish work from the East quite startling. These weavers dyed natural tan, brown or gray wool yarns as well as white wool, extending their palettes in subtle ways. The identification of dyes is NOT an easy matter. Rather strong coral reds have been produced in Central Turkey with natural madder and decreased purpurin. Yet we tend to describe similar hues as "hot" in most Caucasian, Persian and Turkmen rugs and correctly identify those as synthetic. While garish oranges are most often synthetic, oranges were a part of natural dye palettes in some parts of Turkey, and the natural "apricot" hues in older Anatolian kilims are truly lovely. Subtle, natural "aubergine" dyes appear primarily in early pieces, while the brighter purples in later pieces tend to be synthetic. The earliest synthetics, "fuchsine" and "mauvine," were purple/magenta hues originally that faded with time to pale gray. Since their usage rarely extended into the 20th century, their presence in a textile can be a useful indicator of age. Brilliant pinks are frequently synthetic, but pale madder reds and cochineal reds--or their combination-- can be confused with these. Abrash, those subtle (and sometimes not-so-subtle) changes within single-color areas on rugs and kilims, can be present in either natural- or synthetic-dyed pieces. This has most often occurred when dye pots have been so crammed with yarn that the dyes could not circulate freely and penetrate evenly. The flickering color variation that results usually enriches a rug's palette and so can be a conscious choice. This feature has even been imitated by manufacturers of machine-made carpets. Abrupt color changes suggest that the yarns were dyed in separate batches. Usually when problems with synthetic dyes have occurred, they have resulted from incorrect, unskilled or insensitive use. Colors that have faded or run have usually not been fixed properly by simmering long enough in the dye pots. When such dyes were used unmixed, straight from the package, a brash, garish product was almost guaranteed. Unfortunately, that's what we see in a majority of 20th century kilims. Because nearly all vegetable colors are less intense, harmonious results were simply more predictable with their use. On lustrous, long staple wools, any properly processed dye colors can be beautiful, subtle, and become more lovely as they mellow a bit with age. Conversely, no dyes can produce wonderful results on poor quality wool. The use of superb materials is even more crucial in flat-woven textile art than in pile carpets. Vegetable-dyed pieces prevail throughout our gallery collection. Occasionally, though, I have purchased late 19th or early 20th century weavings, realizing that they included one or two chemical dyes, because rarity, ethnographic interest, or esthetic merit justified the choices. After all, exceptional art can be made with any materials, and it is foolish to dismiss beautiful pieces arbitrarily. 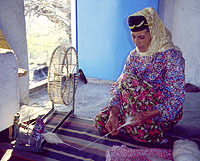 Virtually all surviving Moroccan hambels are 20th century weavings, and few have all natural colors. One cannot maintain a rigid position on dye questions and collect a range of fascinating Berber weavings. The same is true with Tibetan rugs. I can never, however, justify buying bleached or purposely sun-faded kilims. Those practices are destructive and a disservice to the weaver. In selecting functional pieces for use on the floor, especially in high traffic areas, I find it reasonable (as well as economical) to use sturdy, synthetic-dyed old tribal pieces that are genuine ethnographic products if their palettes and designs are pleasing. Such weavings can be far more interesting than contemporary commercial "revival" products that are made with natural dyes, but feature repetitive, lifeless and uninspired designing. Among old weavings, natural-dye pieces are almost always more expensive--typically several times the cost of pieces that include a synthetic dye or two. The "weave balance" and structures of tribal kilims differs considerably from one to another, meaning that a case-by-case judgment is required when we consider how to use them in our homes. Some of these pieces are tough and sturdy enough to handle a lot of traffic; others are delicate and absolutely must be hung or displayed in some other way. The majority are somewhere between these extremes. I have tried in my on-line descriptions to give advice regarding the appropriate use for unusual pieces. The challenge of presenting old textiles on a web site in a reasonable manner is daunting. Although JPEG photo files can now represent the pieces accurately on professionally calibrated systems, monitors and monitor settings differ. Some new LCD monitors come from the factory with brightness and contrast settings that are extreme and artificial. On the other hand, colors may be dull on older monitors. The luminosity of a computer screen can give any piece an unreal aura. But the greatest difficulty is conveying the impact of bold patterning on large kilims through small photos. One should remember that the best pieces are not necessarily those with the most appeal on the screen. The scale of a piece, its details, materials, tactile qualities and physical presence are important elements in the enjoyment of any textile. For a discussion of weaving techniques, go to The Basic Tribal Weaves. For a discussion of restoration questions, go to Restoration Issues. To see a variety of antique textiles, go to Tribal Textiles.